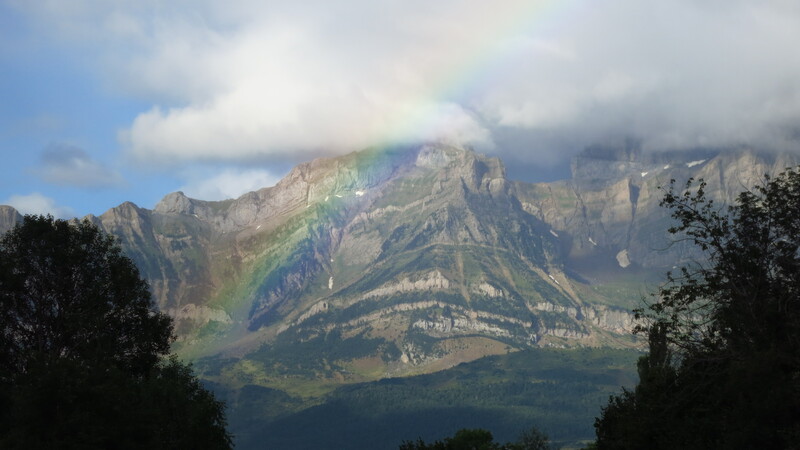 On Tuesday morning I woke up really early, at 6am, because I had to reach the other end of the Pyrenees that day and because that is the time everyone wakes up in a mountain hut if you do not want to miss breakfast. I looked out the window, which faced the gorge I had ridden up the previous day and which was also the route I was going to take today, and the weather was sunny. 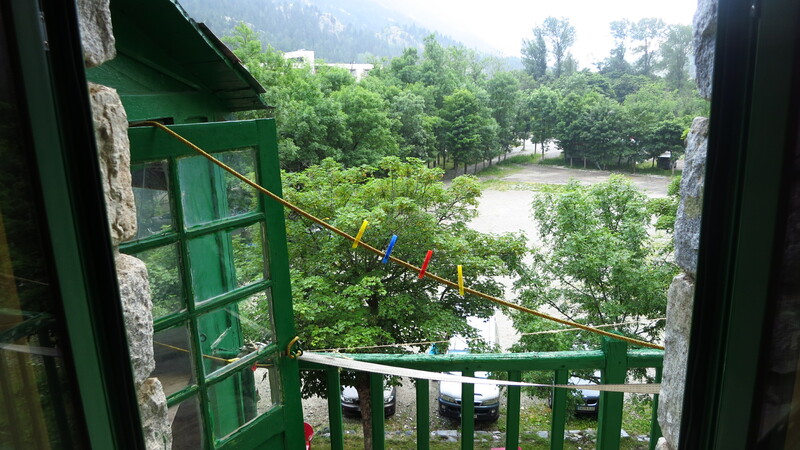 However, once I had finished breakfast and I walked out the front door to get ready, I saw that it was raining and most hikers were sitting in the front porch waiting for the clouds to clear. It was sunny to the south, but right over our heads and the mountains behind us, there was a thick dark layer of clouds. My route was going to take me towards the sun, so I waited for a while for the rain to clear at least from the hut, I did not want to put on my rain gear only to have to remove it 10km later, but half an hour later the situation was exactly the same. Some hikers had donned their waterproof coats and risked it up the mountain, and not wanting to wait any longer I did the same and set off. Sure enough, I did not even reach the main road before I left the rain behind and had to stop and put the rain suit back in the panniers. 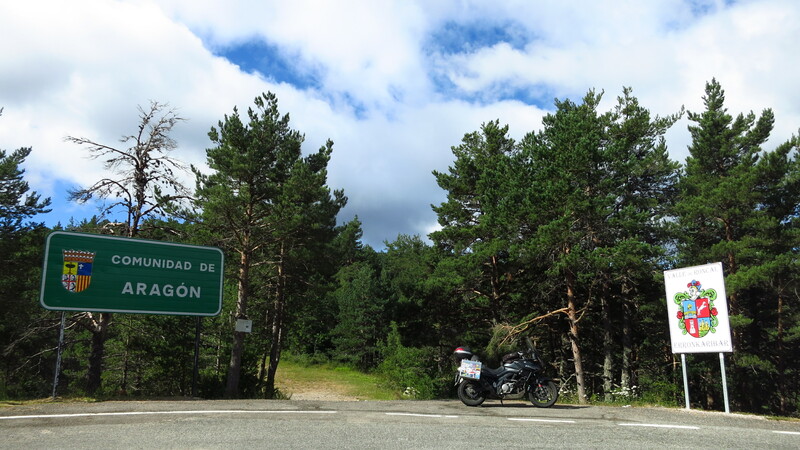 By the time I was on the A-136 to Sabiñánigo it was nice and sunny, the temperature rising quick, and I was looking forward to a great day of riding. In Sabiñánigo I turned west on the A-23, the only stretch of motorway on the whole journey and fortunately not a very long one, it was only built to Jaca, and after that city it was back to the main road which at this point run along the pilgrim route to Santiago for a while, and I saw some groups of pilgrims making their way there. In Puente de la Reina de Jaca I stopped to fill up and check the oil and tire pressures, and looking at the map decided that instead of going straight up to Ansó and Zuriza, I would take the valley to the right of that one, go to Hecho, and then take a road that crossed over to Ansó and another one to meet the NA-137 and then head to the French border. It was clearly a wise decision, there were virtually no other cars on this route, and the views were stunning. The road went mostly thorough pine forests, and soon I was on the border between Aragón and Navarra, climbing higher and higher into the Pyrenees. The weather was still good, but temperatures had dropped sharply as I gained altitude, and I started to realise that I had made a serious error of judgment. When I left Barcelona, thinking that it was summer and temperatures were not going to be low, and wearing a good riding suit (it is not as if I was on a summer jacket and jeans), I had not taken the inner layer or the waterproof layer of the suit. I already had a rain cover to wear if the weather got nasty; I had also taken only summer gloves. For the first days this combination had been perfect, I had even been way too hot on the first day, and I had not been cold in the rain and the fog the day before, but as I was heading down towards the NA-137, it was getting colder than any previous day, and I was missing better clothes. 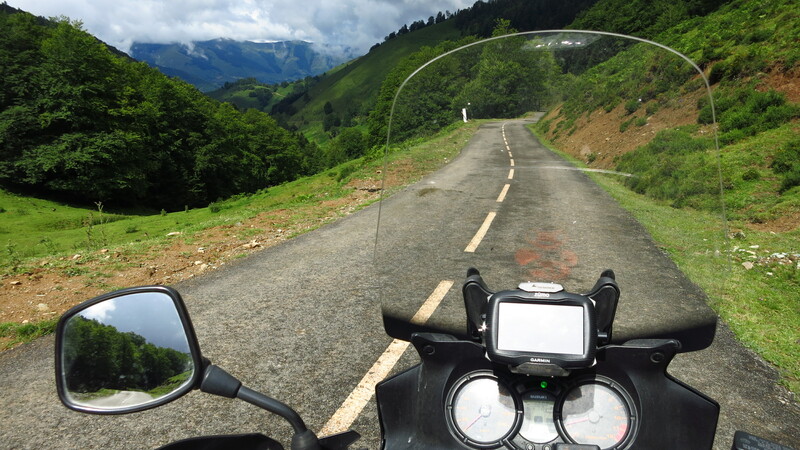 Before I started to ride up the pass to France, I had to put on my rain cover, partly because it was getting cloudy ahead, but mainly to keep warm, and I had turned on the heating grips. My neck was also feeling the chilly wind, and I had to improvise and wrap a thin T-shirt around it. The ride up to the Col de la Pierre St Martin was beautiful, but the low temperature, and the fog that clung to the top of the mountains spoiled it to the point that when I reached the French side I was starting to rethink my route. On the way down I stopped at the Col de Soudet, just a few kilometres down from the top, where the road split. Time to make a decision. 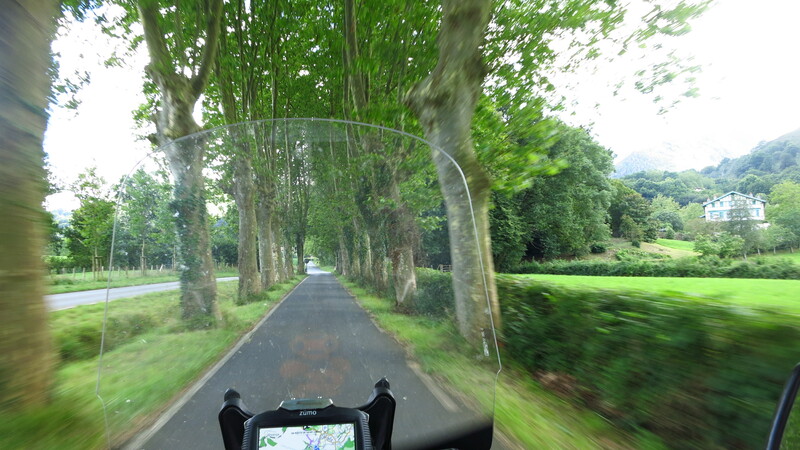 I was absolutely freezing, and if I were to follow the route planned, it would take me a very long time to get to Hondarribia, as it zigzagged between France and Spain across a lot of passes. I thought about just taking a main road and getting there by mid-afternoon, but checking the map I saw that I was at the point of the trip that was further away from main routes. 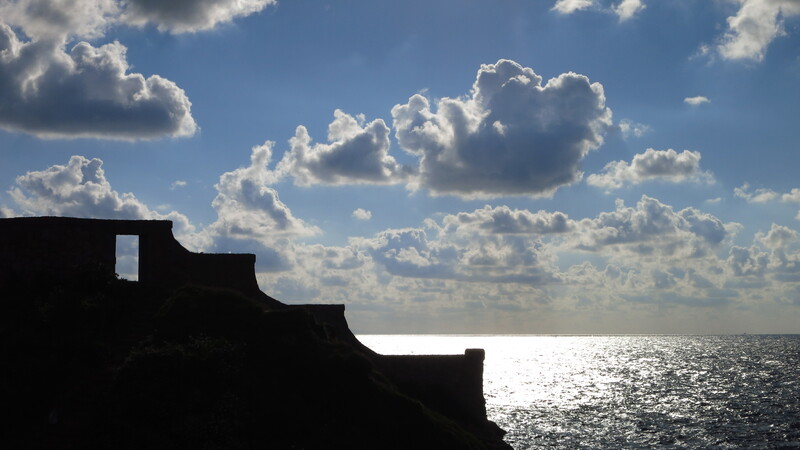 I decided to go on as planned to Saint-Jean-Pied-de-Port and there I would make a decision whether to continue with the planned route or just cut straight to the coast. Oh, and I can tell you it was the right decision without a doubt. Riding down from the pass I quickly left behind the cloud layer, the fog opened and in front of me lay one of the most beautiful valleys I have ever seen. It was the beginning of the best part of the day. 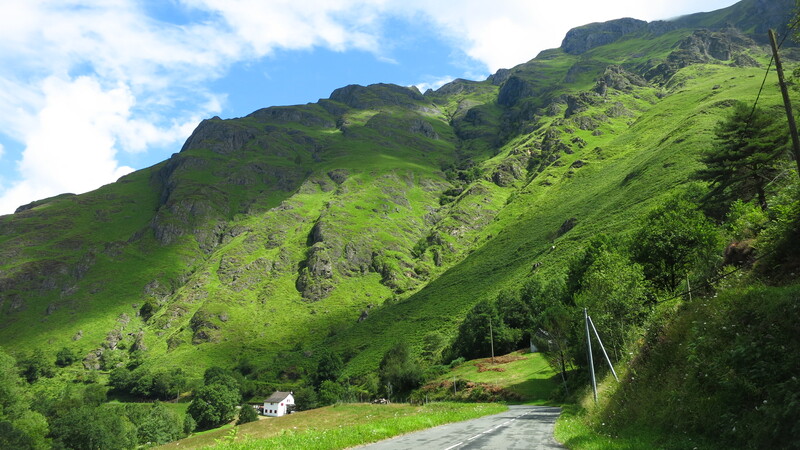 I rode down a narrow valley surrounded of some scenery I had never seen before in the Pyrenees, it was just gorgeous, and it only got better and better. The tiny road I was on dropped sharply to meet the D26 at the bottom of the valley, where I stopped to check the map. As I was doing so, two girls riding Monkey Bikes with little trailers hitched to them rode by, and I saw that they had Dutch plates! I did not have the chance to talk to them, and I wonder what kind of trip they were doing (I could not find anything on a quick search of the net back home) but they were undoubtedly brave to have come so far on such bikes. I took the D26 south-west heading for Larrau. 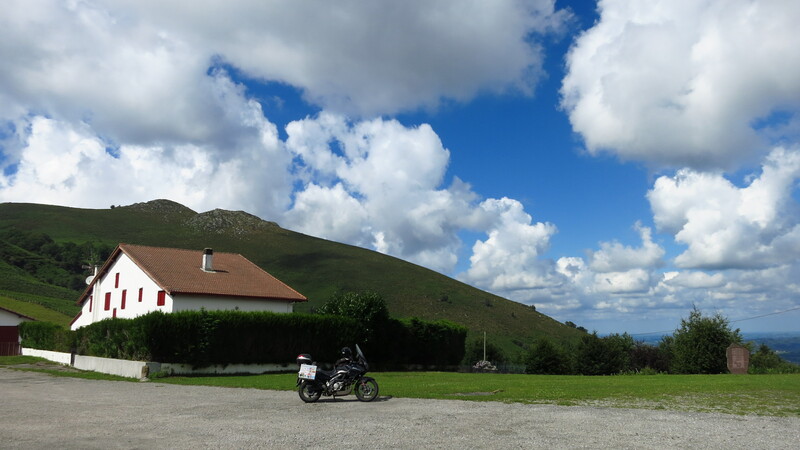 There, instead of crossing the Puerto de Larrau (I was saving that for later), I went west on the narrow D19 across the Col Bagargui, Col de Burdincurutcheta and Col d’Haltza and all the way down to Saint-Jean-Pied-de-Port. This is the main starting point for pilgrims going to Santiago, so I expected it would be easy to find a shop selling hiking equipment where I could buy something decent to put around my neck. I did find a shop near the centre, but it was closed. It was midday, so I waited for a while hoping they had closed for lunch and it was not a bank holiday. Luckily, about 20 minutes later, a woman parked in front of it and opened the shop. I got a light neck warmer I went on my way. I left Saint-Jean-Pied-de-Port on the D918, which went along a river. At some points where the road came close to the water, I saw that there must have been very heavy rains in the past few days, as there were clear signs that the water lever had risen and at some points flooded the fields and even the road, and there were lots of ripped trees and branches strewn on the banks. There were also some tracks running alongside the road, and a bit further down the road, a nice metal bridge took them across the river. I had seen that the electricity poles on the tracks were old and rusty, so I imagined that trains had not run on the line for a long time. Being a bit of a train geek, I stopped the bike under the bridge and climbed through some bushes to get to it and take some pictures. The rails were also rusty, which confirmed my suspicion that the line had been abandoned for some time, but some research I did much later, already back at home revealed two interesting facts: the flooding I had seen earlier was not so recent and the line had not been abandoned for as long as I had imagined. 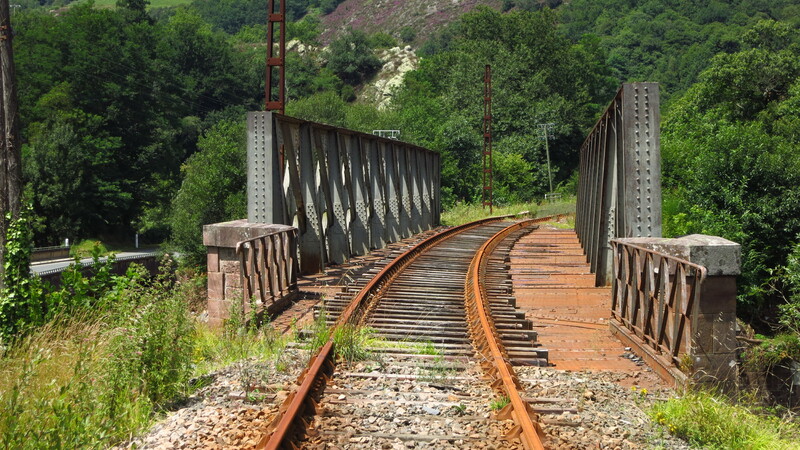 It was a line connecting Saint-Jean-Pied-de-Port to Bayonne, and even though it had been de-electrified in 2010, diesel-electric trains used it until March 2014, only four months before, when the heavy rains that had caused the flooding also caused a landslide that closed the line. I was surprised to read that, because standing on the bridge, the whole structure looked really old and derelict, it was hard to imagine trains safely crossing it as little as four months earlier. 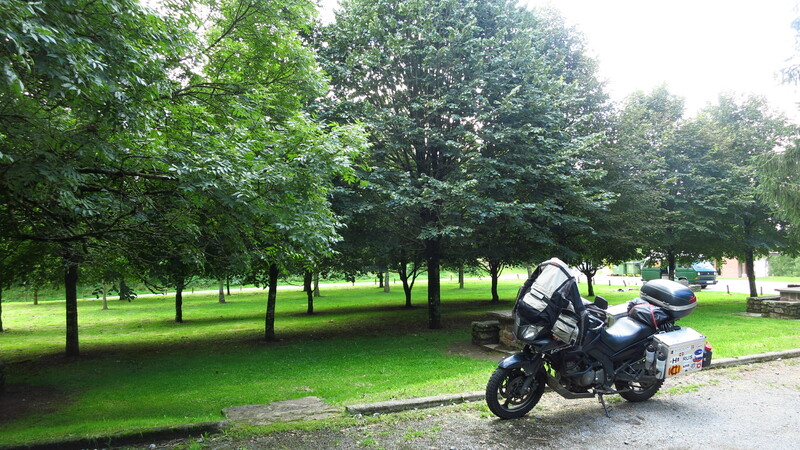 The road turned interesting again when, after reaching Cambo-les-Bains I turned south to head up the mountains, now rather hills, and the Puerto de Otxondo, where I found a very nice picnic area where I stopped for lunch. The rest of the afternoon saw me riding to Elizondo to take the N-121B and then the N-121A, which would take me directly towards the end of my trip, but there were two more passes I wanted to see before getting there, so past Berrizaun I turned right and took the NA-4400 to cross the Puerto de Lizarreta, went down to Sare, rode around the town and turned back up heading to the Collado de Lizuniaga and down to meet the N-121A again. It was a well-worth detour, and other than a couple of concrete mixing trucks that seemed to be going from nowhere to nowhere and spoiled the first few corners of the climb, the rest of it was wonderful. 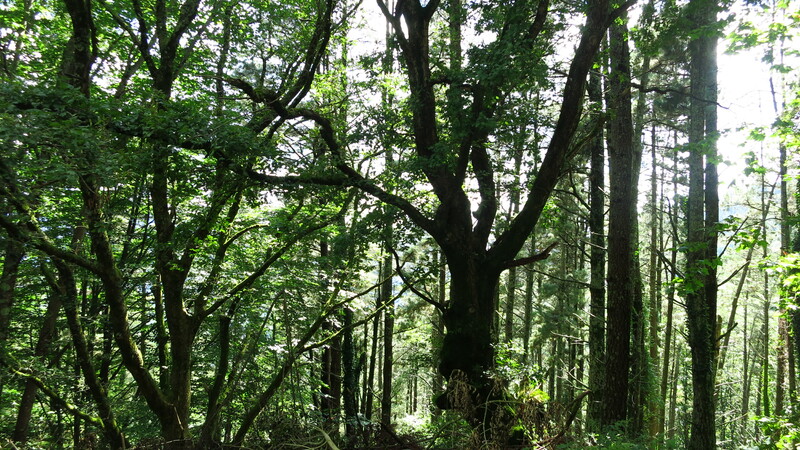 The forest was so thick that I took very few pictures inside, as there was not much light. 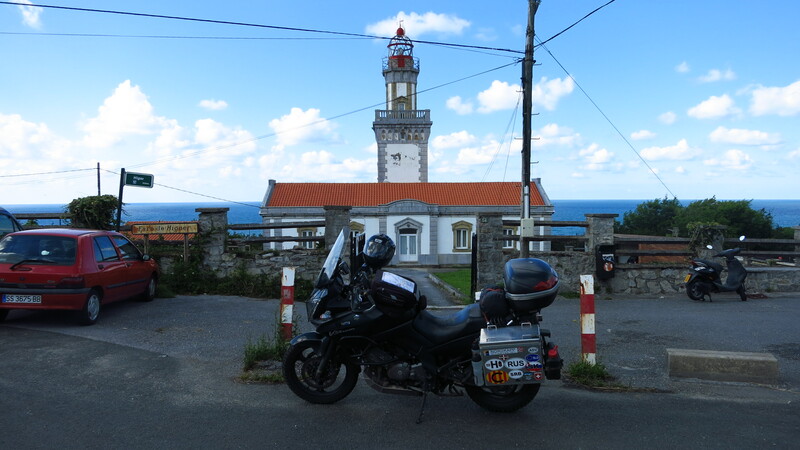 Not long after rejoining teh N-121A I finally reached Hondarribia and having been there recently, rode straight through to Cabo Higer, where the lighthouse that marked the end of my trip was waiting for me. It had taken me five days and 1,347km. 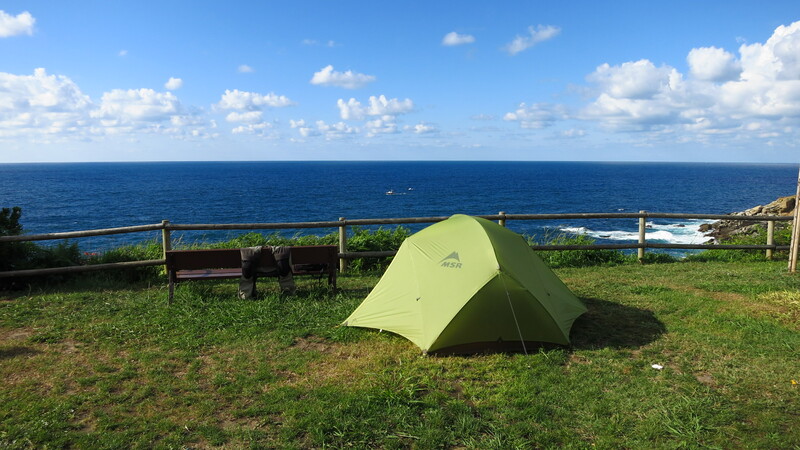 Right next to the lighthouse and overlooking the ocean, there is a campsite with what must surely be some of the most stunning views I have enjoyed from my tent. I set camp next to a wooden fence on the edge of the cliff and watched the sun set as I had dinner. This entry was posted in Trans Pyrenees 2014, Travel and tagged Cabo Higer, Col Bagargui, Col d’Haltza, Col de Burdincurutcheta, Col de la Pierre St Martin, Col de Soudet, Collado de Lizuniaga, Puerto de Lizarreta, Puerto de Otxondo, Refugio Casa de Piedra by Kilian. Bookmark the permalink.